Parasympathomimetics also called cholinergic agonists or cholinomimetic drugs are the drugs that activate cholenergic receptors. These drugs have the positive effect on cholenergic receptors like acetylcholine. 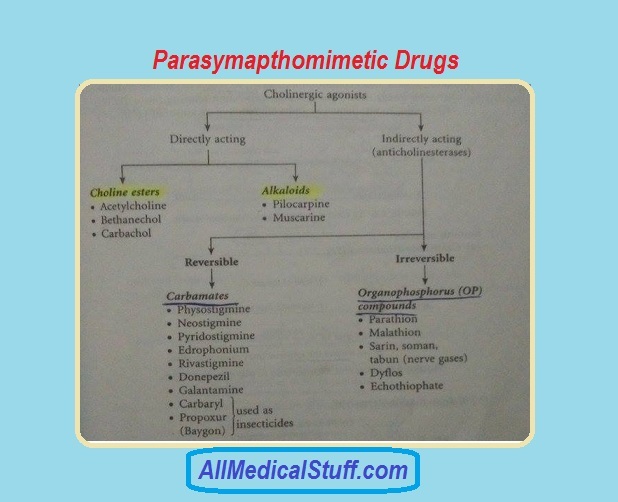 Although the terms parasympathomimetics and cholinergic agonists are used alternatively but it is not true. Because all the cholinomimetics are parasympathomimetics but not all the parasympathomimetics are not cholinomimetics. The reason is that, colinomimetics acts on all the parasympathetic receptors but it also acts on some of the adenoreceptors as well. But as adernergic receptors that are activated by acetylcholine or similar drugs are only gangloinic neurons and that of sweat glands etc therefore the collectively it is referred to as parasympathomimetics. So now if your concept of parasympathomimetics and cholinomimetics is cleared, now you have to learn its classification and the names of drugs that have acetylcholine like action, their effects, pharmokinetics and side effects etc. These drugs are broadly classified into two classes i.e the one that have actions like acetylcholine and the other the increases the effects of acetycholine by preventing its degradation. As mentioned above, these drugs are natural or synthatic substances that have the same actions like acetycholine. The drugs are more potent than Ach and are less degraded by acetylcholine esterases. Drugs in this class include two groups i.e the one that are choline esters and the others that are alkaloids. Acetylcholine is a choline ester that is an endogenious compound. It acts on both the muscarinic and nicotinic receptors and is degraded by both true and pseudocholinesterases. On heart it has a negative inotropic, negative chronotropic and negative dromotropic effects. Which means Ach has inhibitory action on heart. On blood vessels it has vasodilation effect. In GIT, it increase the tone, paristaltic movements and secretion. And on the other hand it relaxes the GI sphincters. On urinary bladder, it cases urination by contracting the detrusor muscle and relaxing the trigone and sphincter. While in bronchi it causes broncho constriction and that’s why it is contraindicated in asthmatics. In all types of glands, it enhances secretions and in eye it causes pupil contriction. As mentioned, indirect parasympathomimetic drugs include those agents that inhibit the enzyme cholinesterase either reversibly or irreversibly. They bind to the active sites of these enzymes and prevent the attachment of acetylcholine. Therefore, acetylcholine is not degraded and remains for longer time and stimulate its recportors again and again. This group of drugs are widely used because they are more safer and have wide clinical applications as compared to irreversible, which are mostly poisons and used as insecticides. As mentioned, these drugs have limited use and mostly used as insecticide. The only drug that has therapeutically usage is Echothiophate.